BY ANNIE HUSTON, BIRDSALL & CO. In the flower bulb world, bigger is better; that’s according to the folks at Colorblends, a huge importer of bulbs. Large bulbs produce more. I’m a lazy gardener and if I’m going to spend an afternoon planting bulbs, I want it to have an impact and be HUGE in the spring. Pansies are still my most favorite bloom in the garden, but bulbs are a close second. Start planting when you feel the need to wake up in the middle of the night to get a blanket, or turn the heat on in your car, and don’t hear crickets any more. But seriously, when nighttime temperatures stay between 40 and 50 degrees. Anywhere you will be charmed to see their blooms in the spring. Annual beds – I prefer pansies in annual beds. Planting bulbs would prevent a good tilling to prepare the bed for annuals, unless you treat bulbs as a cool weather flower only. I’m too cheap for that. Perennial and shrub beds – This is where most of the bulbs will end up. You create groupings of bulbs that are nestled amongst the perennials and the shrubs, and the result is a natural display of color throughout the beds. The legend goes that you throw handfuls of bulbs in the air and plant them where they land for a very organic look. Tried it and had a good laugh. Indoor windowsill – In Colorado, you grow these gigantic bulbs indoors and place them in a sunny window. Don’t water much and wait for around 12 weeks and it will give you something to look forward to, right after the holidays. Think Amaryllis galore! Tulips – If you want to plant large spaces, pick the Darwin tulips, which are the best mid-season (think after the last snow) landscape tulips. As a perennial tulip, they will come back for 2 to 3 years (mine are on their 20th year, I promise!). Mix them with Grape Hyacinths. Here are some of the names you will see in the garden centers or in catalogs: Beauty of Aperldoorn, Beauty of Spring, Chardonnay, Pink Margarita. I happen to like the blends pre-mixed by people who know a lot more about tulips than I do. The combinations are endless and will make you look like Martha Stewart. The names are very descriptive too: French Blend, Pillow Talk, Prosecco…sounds like the beginning of a novel! Cubed tulips – structured as a clean-lined flower, as the name describes. These are good for accountants, engineers, or any other person who enjoys straight lines and linear displays of precisely the same height. Single color tulips – I especially like them when they have double blooms. The emphasis is on the texture of the flower and secondarily on the color. The Akebono tulip from Japan reminds me of a yellow peony! Wild Tulip – Usually shorter, they are still the forebears of the big hybrids and can teach them a thing or two. Plant them in informal landscapes, in the back forty, or in rock gardens. Don’t fret about the design as it is supposed to be natural looking. Mix Turkestanica tulips, with Praestans Shogun, Bakeri Lilac Wonder with muscaris and dwarf daffodils, and there is no need to travel in the spring. Daffodils – Or is it Narcissus? Botanically, all daffodils belong to the genus Narcissus, which explains why some people refer to daffodils as “narcissus.” Daffodils for naturalizing will not only produce 2 or more flowers the first spring, they will come back for years. With daffodils, not only is bigger better, more is better, too. These plants are tough and low-maintenance. 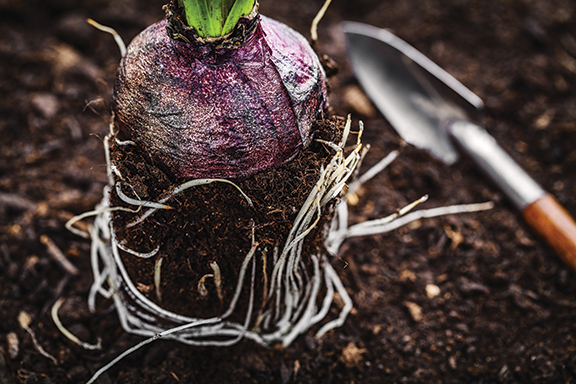 Give half a day of sun, well-drained soil, don’t pay attention to them, and they’ll thrive. King Alfred – So here’s the scoop. It used to be the best of the best and became a household name. But the production has declined in favor of other equally, if not better, daffodils. Remember that deer and rodents don’t like them. Daffodils in general are not their thing. Yellow or white daffodils – Traditional yellow daffodils pair well with white blooms. The Mount Hood all-white daffodil is a landscape staple and will not disappoint. Or, go straight to the blends. Pink and Lemon are fantastic in mass plantings. For spaces closer to where you will enjoy the details, pick the double daffodils. Try Tahiti or Flower Parade in small clumps. Miniature daffodils are perfect for small spaces like a rock garden. They will look like a fairy planted them. Hyacinths – Soooo fragrant! Combine Blue Jacket with yellow daffodils since they bloom at about the same time. City of Haarlem is supposed to be pale yellow. They mature to ivory really quickly, so no bright yellow hyacinths yet, but plant daffodils if you must have that color. Specialty bulbs like Grape Hyacinth (Muscari), Crocus, Snowdrops, Squill (Scilla) are all short plants that are powerful understudies to the tall blooms. Crocus planted in the lawn give a natural and organic effect. Be sure you let the leaves yellow before you start mowing. Tip: use accent bulbs sparingly so your garden doesn’t start looking like Disneyland. Red Crown Imperials – Fritillaria imperialis. Majestic plant that looks like nothing you’ve seen before in your garden. Look it up! Alliums – After the tulips are done blooming, here come the alliums. Their starry heads will pop up to 34”-48” tall. Cut one for a splendid show in a vase. Try a dozen of the Christophii, Stars of Persia and your neighbors will stop by to gawk. Hori-hori – Can’t go wrong with this multi-use tool. Made in Japan, it is a wooden handle with a stainless steel blade that is serrated on one side and has depth markings in inches and millimeters. Use it for bulbs and everything else in the garden. Literally. It is not too soon to start thinking and ordering your bulbs. That’s when the glass of Champagne comes in!